I have heard of people gardening by the moon. Does it really work or is it some kind of Wicca or pagan thing? Have you ever done it? Thanks for the question, Carrie. Yes, I have used the moon cycles to plan my garden and yard work for years. It doesn’t mean that you are all about Mother Earth or anything. Gardening by the moon phases means that you are working with nature rather than against it. Gardening according to the phase of the Moon is a centuries old practice, practiced by ancient cultures the world over. It has been long known that the Moon has a strong effect on our planet and its’ inhabitants. Its gravitational pull guides the ocean tides as well as our own inner tides. Plants are no different, as with the sea and our bodies a plant’s water content is affected by the pull of the Moon. Same for the insect, weed, fungal, and bacterial pests that may be attacking your plants. People long ago lived by the cycle of the Sun, Moon and the seasons. In today’s busy world many choose not to track the Moon phases and instead opt to purchase a farmer’s almanac. The Old Farmer’s Almanac and The Farmer’s Almanac both contain useful gardening sections that do all the planning for you. With these you have everything you need for growing a successful garden, flowerbed or orchard. There are two methods of practice, one is by the Moon’s phase and the second is by the Moon’s phase as well as its placement in an astrological sign of the zodiac. I admit, I have always used the former in my garden. The Moon’s month long cycle can be separated into two halves, the waxing and the waning. The first half of the monthly cycle is from just after the New Moon to the Full Moon. The Moon grows larger and brighter and it is this lighter half that stimulates growth in a plant. One common practice that has been used for centuries is to plant just after the New Moon as this gives the seed, plant or transplant two weeks of increasing, moonlight and gravitational influence to encourage germination and growth. Plants that flower and/or bear fruit above ground are best planted during the first quarter which is roughly a one week period from the day after the New Moon (or so) to the first quarter Moon. The first quarter to the Full Moon is the ideal time to plant brambly fruits such as blackberries, raspberries and the like. This first half is also the best time to water your plants. As the Full Moon nears harvest any juicy berries, succulent leafy greens or other veggies for their optimum water content. It is also best to harvest herbs at the Full Moon as their essential oils are strongest, fragrant flowers will have stronger scent too. Thank you for the email regarding how to grow and store your shallots. Perhaps the biggest single advantage offered by growing from seed is that the viral, fungal and bacterial diseases which can affect vegetative material do not affect seeds. A healthier crop is, therefore, assured. Secondly, the problems involved every year in the storage of shallots, such as rotting, sprouting and dehydration, can now be things of the past. Staying with the quality angle, to produce the best yield of well shaped bulbs it is important to sow seed at one every 1/2 inch (1 per cm). Seed sown too thinly can result in the bulbs becoming coarse and splitting. First I start with some soilless mix that I mix up myself and an empty seed flat (I reuse mine from year to year making sure to wash them well between uses). I usually mix some Dr Earth Starter Fertilizer in my starting mix and this has given me great luck with my seedlings. Soilless mix is often dry and if it contains peat moss it doesn’t moisten evenly unless you use warm water. So usually I warm some water to moisten the trays, I let it cool before I add the seeds. I sow a few seeds per cell in my flat and then I dust lightly with some more seed starting mix and then mist lightly with water to moisten the top. Then on the covers go waiting for the seeds to germinate. Some seeds like it warm, and shallots are one of those, I use an electric blanket on low wrapped around the other flats to warm them (make sure you use plastic so you don’t get your electric blanket wet). Keep an eye out for germinating seeds and then under the grow light they go. The best way how to grow shallots in loose, well-drained soil that’s been amended with organic matter. They also prefer areas receiving full sun. Shallots are often planted in early spring or as soon as the soil is manageable in warmer climates. Plant them about an inch or two deep with the tips slightly protruding from the soil’s surface. Space shallots about eight inches apart to prevent overcrowding. Harvest shallots when the bulbs are about a quarter inch around but wait for the leaves to yellow before lifting. For an extended harvest season, plant and harvest the largest shallots first, replanting smaller bulbs in their place for harvesting later. Once shallots are harvested, any unused bulbs should be stored. Dispose of any bulbs that appear soft or bruised. Shake off soil once lifted from the soil and allow shallots to remain in a warm, dry area for about a week prior to storing. Then place them in a mesh bag and store them in a cool, dry place. They should last at least six months if properly cared for. Onions fit into three categories: short-day, intermediate-day and long-day varieties. Short-day onions will start making bulbs early in the year when day length is only 10-12 hours. They are often mild and soft-fleshed making them unsuitable for storage. The more pungent long-day onions will bulb up much later in the year, when day length reaches 14-16 hours. Gardeners in plant hardiness Zone 7 and south will succeed best with short-day varieties. Zones 5 & 6 will probably be able to grow these varieties, too, if they are planted in late winter instead of in the fall. Intermediate-day varieties will work for most gardeners in Zones 5 & 6 while long-day varieties will succeed in Zone 6 and colder zones. There is obviously some overlap with varieties that require shorter days being adapted to climates where much longer days occur. The key factor here is whether these varieties have sufficient time to make enough growth before lengthening days signal the bulbing response, and of course, the days have to get long enough to signal the response. As for how to plant, you have a few options. For a March 1st planting date, I would recommend getting your seeds started as transplants as soon as possible. Growing your own transplants requires at least 7 weeks so time your sowing date so that you transplant after your last hard frost. Onion seeds do require some warmth to germinate so start them indoors at this time of the year. Choose either a sterile seed mix or make your own seed starting mix with compost, sand, and peat or coir. Seeds should be sown about 1/4″ deep either in individual cells or 6-8 seeds per 2-inch cell in the larger seed trays. Since the seed is so shallow, the soil needs to be kept moist so either cover the seed tray with a dome, saran wrap, or enclose in a plastic bag. Germination should occur in 7-14 days. As the seedlings grow, provide supplemental light to keep the leaves healthy and short. Begin feeding the onions with dilute fish fertilizer every 2 weeks. Do not thin the onions or else you might disturb their shallow root system. 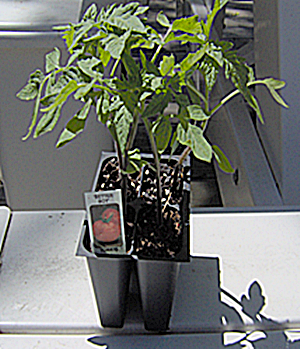 However, to promote thicker stems, cut back to leaves to 3″ every couple of weeks. As we are getting down on time here for a March 1 planting date, your other options are to purchase plants or sets. Onion plants are just that — bare root seedlings that are about 3-4 inches in length. These are transplanted into the ground like any other transplant. Onion sets resemble dry, miniature onion bulbs. They are planted in early spring (as soon as the soil can be worked) in rows marked at one foot apart and with the onion sets planted three inches apart and about one inch deep. No matter which method you use for planting, onions require a high source of nitrogen. A nitrogen-based fertilizer (ammonium sulfate or ammonium nitrate) should be applied at the rate of one cup per twenty feet of row. The first application should be about three weeks after planting and then continue with applications every 2 to 3 weeks. Once the neck starts feeling soft do not apply any more fertilizer. This should occur approximately 4 weeks prior to harvest. Always water immediately after feeding and maintain moisture during the growing season. The closer to harvest the more water the onion will require. For weed control a pre-emergent herbicide (DACTHAL) should be applied prior to planting. This will provide weed control for approximately one month after planting. Other products such as GOAL and BUCTRIL, can assist in weed control during the growing season. Always follow label instructions. For organic gardeners a rich compost high in Nitrogen should be incorporated into the soil. Unfortunately, there is not any product available to assist in weed control so the only method will be cultivation. While cultivating be careful not to damage the onion bulb. As the onion begins to bulb the soil around the bulb should be loose so the onion is free to expand. Do not move dirt on top of the onion since this will prevent the onion from forming its natural bulb. Start early with cultivation practices. Onions are fully mature when their tops have fallen over. After pulling from the ground allow the onion to dry, clip the roots and cut the tops back to one inch. The key to preserving onions and to prevent bruising is to keep them cool, dry and separated. In the refrigerator, wrapped separately in foil, onions can be preserved for as long as a year. The best way to store onions is in a mesh bag or nylon stocking. Place an onion in the bag and tie a knot or put a plastic tie between the onions and continue until the stocking is full. Loop the stocking over a rafter or nail in a cool dry building and when an onion is desired, simply clip off the bottom onion with a pair of scissors or remove the plastic tie. Another suggestion is to spread the onions out on a screen which will allow adequate ventilation, but remember to keep them from touching each other. As a general rule, the sweeter the onion, the higher the water content, and therefore the less shelf life. A more pungent onion will store longer so eat the sweet varieties first and save the more pungent onions for storage.